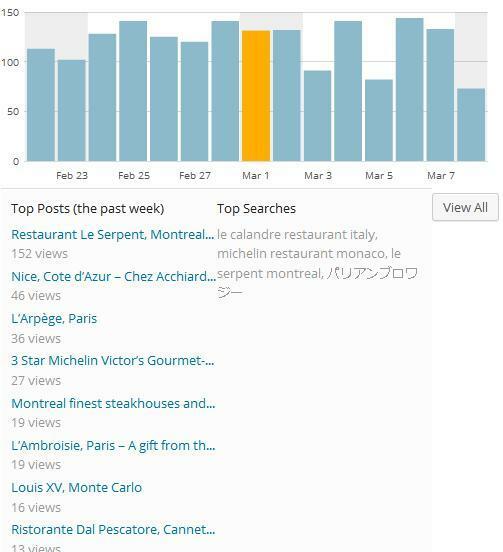 ***Restaurant Le Serpent seems to be a popular choice in your Mtl restaurant searches. In one week alone, 152 people were looking for it on current web blog (see below table from the visitor logs on my site). For sure, most foodie web sites attract thousands of searches, but those are backed by money, agressive advertisements and close relationship to the restaurant world. The most genuine feel is always to be found on a blog that advertises nowhere, backed by no one, which is the case of this unassuming blog of mine which only intent is to share with close friends/relatives. ***Montreal has now a new hip place in the form of Bier Markt (same location where la Queue de Cheval used to be, on René Levesque). Went there recently and I thought I was in New York or any big city with an exciting nightlife scene. The atmosphere there is second to none in town, at this moment: incredibly fun, full of people. I haven’t tried the food yet, but the bar offerings are top class and the quality of the beer simply exemplary. BM sets the bar in Montreal for this genre of destinations (bar/5 to 7 gatherings, etc). ***Marchand du Bourg‘s Maitre boucher Marc Bourg continues his impressive rise to stardom with now plenty of restaurants using his steaks and a huge demand coming from all parts of the globe (Las Vegas, the Middle East, etc). Mr Bourg’s initiatives are one of the latest most exciting success stories of Quebec and this is well deserved from a man whose exceptional dedication to the best steaks possible is matched only by few Maitre boucher around the globe. I already wrote about this great artisan here. Simply the best steak in town at this moment. ***New York: NY is not far from Montreal, so I recently spent a weekend in NY and see if Peter Luger is still doing great especially after reports from some food journalists about PL losing a bit of its past glory. I was impressed to see that PL continues to deliver some of this globe’s finest steaks. The Porterhouse steak, their star item, remaining as glorious as ever. PL is what it is, not what you want it to be, which is exactly how things should work: it has its charms, its weaknesses, its own character. You learn to know what they are, if that pleases you, you go, if that does not fit, there you look elsewhere. I want PL to remain as it is regardless of the pressure that new trends put on our perceptions/appreciations. ***Michelin France 2014: It’s published and France has a new 3 star Michelin, L’Assiette Champenoise in Reims. There are changes that I did not quite understand like the 1 star assignment of Septime in Paris, which I did visit on past trips in Paris and was so unimpressed that I did not even bother writing about, the demotion of Apicius, Auberge de l’Ill, Stella Maris. Anyways, there are always going to be happy and unhappy ones, so I won’t lose time on trying to convince why those places should not have lost their stars. I just hope that we find a way to avoid turning the back to the past (classic cooking should not be overlooked just because new generations of diners find new-gen flavors more exciting). ***Catalan celebrity Chef Ferran Adria is back in the news with a new restaurant (named ElBulli 1846??) in 2016 – Click here to learn more. ***Restaurant Pastis, almost an institution of New York has sadly just closed recently. You can read more about that, here. ***Legendary 3 star Michelin Maison Troisgros in Roanne, France will move to a new location (still in Roanne) in 2017. Here, for more.